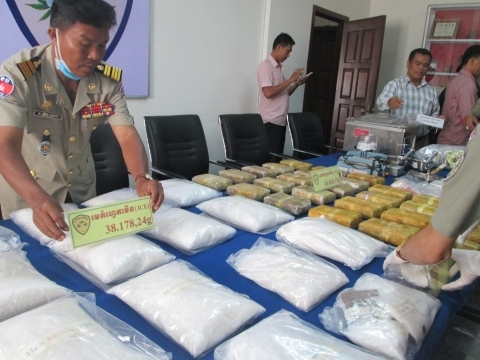 PHNOM PENH, (Khmer Times) -- Over 54.5 kilograms of methamphetamines and heroin have been seized in Stung Treng province, as a result of a huge crackdown on drugs in Cambodia. The haul was revealed in a press conference today at the headquarters of the General Commissioner of National Police. Deputy Chief of the General National Police, Lieutenant General Mok Chito, said in the press conference that the drug operation was conducted over the last three months in joint cooperation with Phnom Penh police and Stung Treng province’s police. Four people were arrested during the drug crackdown, in possession of materials related to producing drugs, Lieu. Gen. Mok Chito said. According to the Deputy Chief, the seized drugs had an estimated value of nearly three million dollars. One of the accused, believed to be the ringleader of the team, has not yet been transferred to Phnom Penh and was not named. The other three accused were identified as male persons Ni Yong, Teng Ya Ning and a Cambodian woman, named as Phal Rany. Lieutenant General Mok Chito hailed the good work of the General National Police. “It is not only [to] stop the distribution of drugs in Cambodia, which causes thousands of people to suffer, but it also can help other countries, where the drug is planning to be sent to,” he added. According to police, the drugs had been imported from the Golden Triangle area in Myanmar via Laos and processed to increase the quantity in Cambodia. Some of the drugs were set to be distributed locally, while a portion was earmarked to be sent to Taiwan. “Cambodian authorities will continue to investigate this case in cooperation with neighboring countries and international partners,” Lieut. Gen. Mok Chito said. “This is the third massive drug crackdown, in recent times,” he said. Under questioning, the suspects are alleged to having admitted to drug importation and distribution on two previous occasions, the police said. The police are now preparing documents prior to sending the accused to court.